SUPPORT FOR FINE Gael and Enda Kenny has dropped, according to the latest opinion poll for the Sunday Times by Behaviour & Attitudes. The ruling government party has dropped three points to 23%, while support for the Independent Alliance has fallen two points to 3%. The poll says that Fianna Fáil is the most popular party, with 29%. Sinn Féin, meanwhile, dropped two points to 17%. Labour (5%), Greens (3%) and the Social Democrats (1%) were unchanged, while the Anti Austerity Alliance-People Before Profit rose one point to 5%. Non-aligned independents have made the biggest gain, up six points to 15%. Earlier this week, the Taoiseach told delegates at the World Economic Forum in Davos that there was no chance of a general election in 2017. 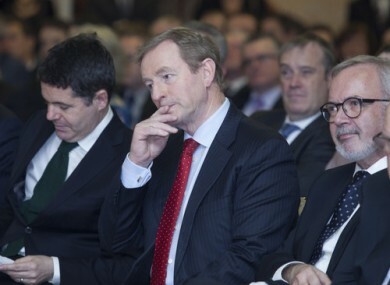 The Fine Gael leader’s personal approval rating fell four points to 29%. Just under a third of those surveyed – 31% – said they were satisfied with the government. Micheál Martin was by far the most popular leader, with an approval rating of 49%, while Gerry Adams shared the same satisfaction rating as the government with 31%. In terms of core party support, around 23% of people are undecided on which party they support, which is the highest proportion of undecided voters since last year’s General Election. Email “The latest opinion poll has been published, and it's not good news for the government”. Feedback on “The latest opinion poll has been published, and it's not good news for the government”.